In this rare defect, the two large arteries that leave the heart, the aorta and the pulmonary artery, are combined in one large vessel, known as the Truncus Arteriosus (1 in diagram). This vessel carries blood to the lungs as well as to the body. In addition, there is a large hole (3) in the ventricular septum - the muscle wall that separates the left and right ventricles (the heart's pumping chambers). This hole is known as a Ventricular Septal Defect (VSD) and the truncal artery overrides (straddles) the VSD. 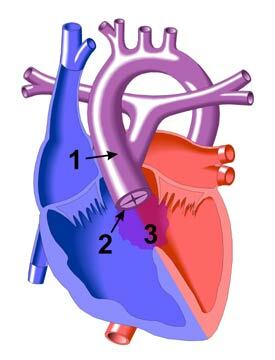 The valve of the Truncus Arteriosus (Truncal Valve) is often abnormal in form, sometimes with four valve "leaflets" or flaps rather than the normal three (2). The valve can be thickened and narrowed, causing obstruction to blood as it leaves the heart. It can also leak, causing blood that leaves the heart to dump back into the pumping chamber across the leaky (insufficient) valve. Truncus Arteriousus can occur with other genetic disorders.